I really wanted to like Alien: Blackout, even if just to prove to all the naysayers that a mobile Alien game can be truly fun and well-designed — especially one without any ads or in-app purchases. And at first, it seemed like that would actually happen. 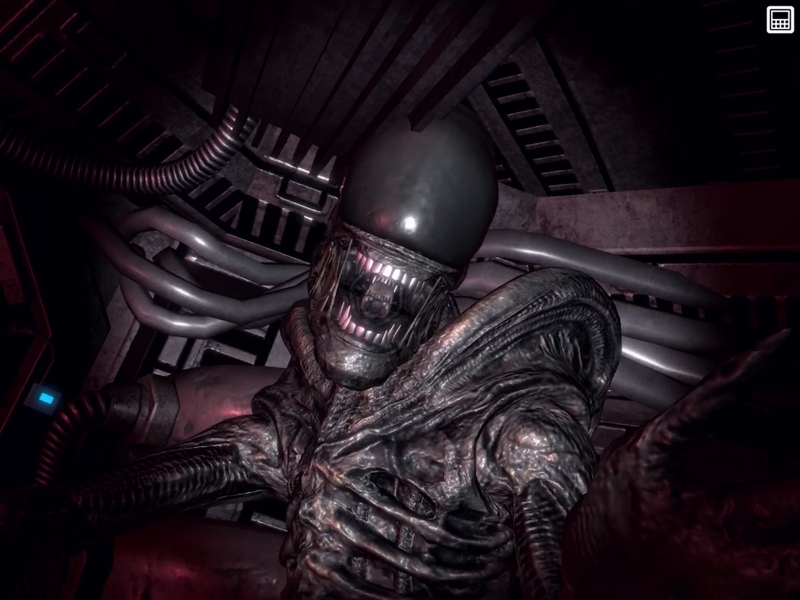 The overall concept sounds like a perfect fit for the both the franchise and touchscreens — monitoring the xenomorph through different camera feeds. I was super impressed with the soundtrack and voice acting, especially Amanda Ripley’s, and I was genuinely nervous seeing the alien stalk about the ship. Watching it climb into the vents and disappear, with no idea where it would emerge, was exactly the kind of experience I was hoping for. But what I liked about the game in the first few minutes fell apart soon after when things became much tougher. In fact, even though I had the game ahead of release, I almost didn’t write this review. I was so frustrated with it that I nearly quit altogether before even completing the second level. But the more I played, the more I had to say and the more I wanted to review it. 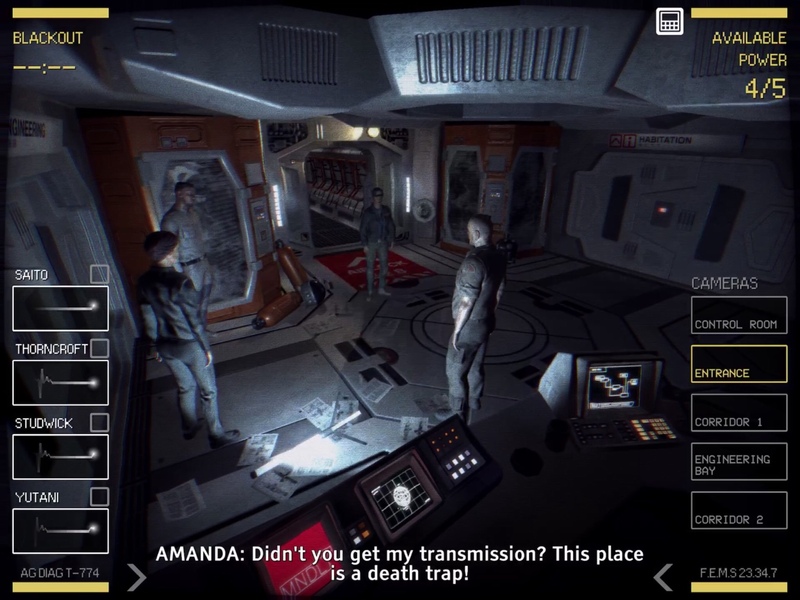 In Alien: Blackout, you play as Amanda Ripley, communicating with four crew members and guiding them around the ship to complete different objectives. You’re hiding in a vent and can’t move, but instead have a screen in front of you that’s hooked up to different camera feeds. You need to use those and the map to keep you and your crew alive. And you need to complete each level in under eight minutes or it’s Blackout and game over. Comparisons will obviously be made to Five Nights at Freddy’s and, granted, I didn’t like that enough to stick with it for long. But Alien: Blackout seemed more promising from the get-go. It was certainly more impressive audio-visually, and the alien is genuinely scary when you see it, at least at first. Perhaps if more of the game was spent looking at the cameras, it might have actually been enjoyable. But the map quickly becomes the main focus, watching and micromanaging the little dots on it. On the map, you can select a dot that represents a crew member and draw a path for them to follow. You can also use the commands on the left side of the screen to instruct them to STOP, HIDE, HURRY UP, SNEAK, among others. If they’re hiding, the alien won’t see them, but they have to hide in time. Sometimes they’re smart enough to hide on their own when they see it, but they can also be really dumb and try to run instead. So you need to keep a close eye on them, as well as the creature. 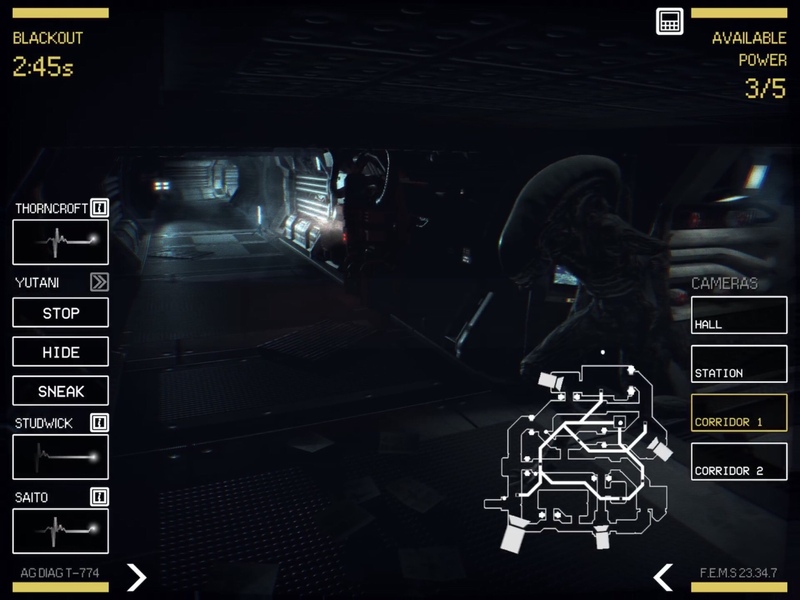 The xenomorph shows up as a red dot, but only in the rooms with motion trackers, and only if it’s not crawling through a vent. Everywhere else, it’s invisible, with only visuals on the cameras or screams and red warning signs coming from your crew members. Once you know where the alien is, you can tap a door on the map to close it and keep the alien somewhat contained. But you’re limited in power, and the motion trackers each use one of the five power sources. So you have to pick and choose which doors to open and close. On the camera view, you’re very limited as to what you can do. There aren’t cameras in every room, but they’re mostly meant to fill in blind spots for the motion trackers. 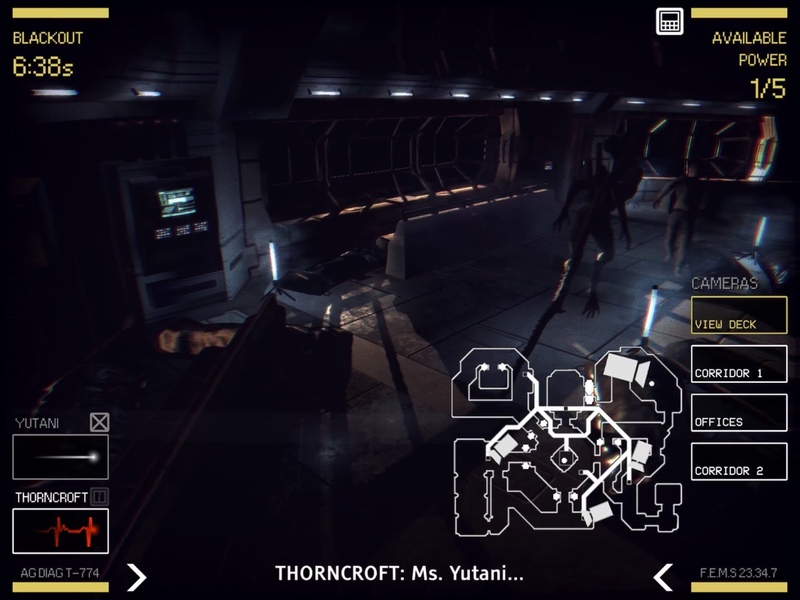 You can see your crew members and you can see the alien, but you can’t interact directly with them. 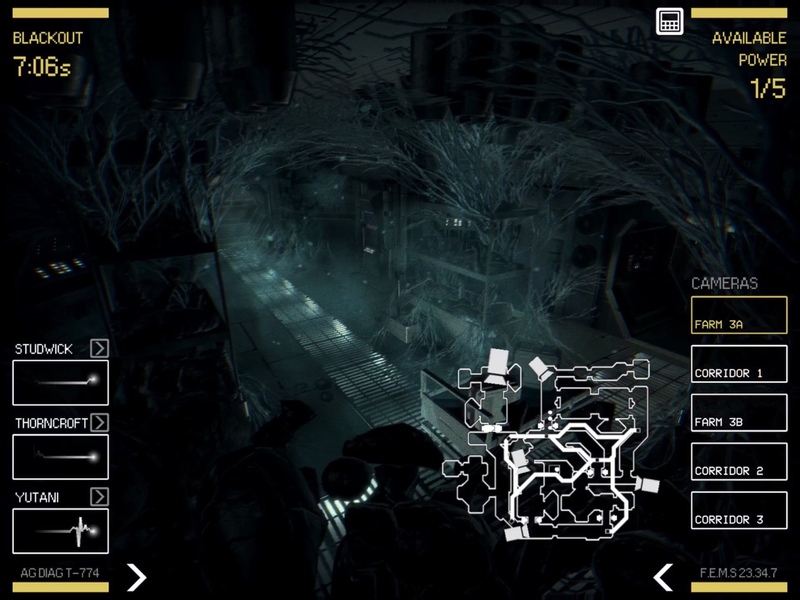 If you manage to follow who’s who from the footage or the tiny version of the map, you can still select characters from the user interface on the left and give them commands like STOP, HIDE, HURRY UP, or SNEAK. But you can’t tell them where to go from there or really tell which dot is which person so you can give them orders. Basically, the more time you spend looking at the cameras, the more likely you are to get someone killed. They’re meant to be glanced at quickly while you keep most of your attention on the map. And that’s quite boring, to be frank. If all that wasn’t enough, you also have to protect yourself, Amanda, from the alien. Closing a vent door shuts down the whole control center until it opens again, so you have no way of permanently protecting yourself from the alien and are instead left completely vulnerable. The only way to close the vent doors to defend Amanda from the incoming alien is through the first-person view, so you have to leave the map view to access it. 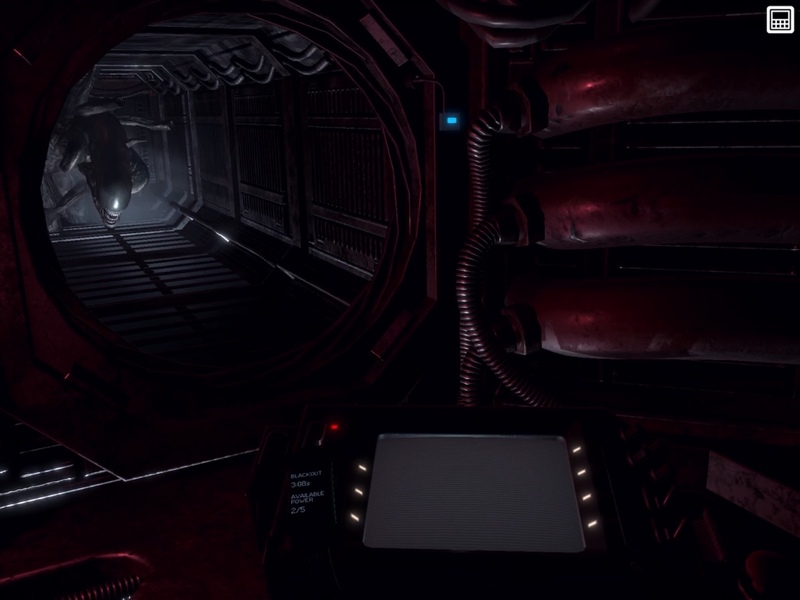 Also, your main warning that the creature is heading towards you in the vents is the sounds it makes, so you really must wear headphones to have a chance at surviving this game. At first, there’s only one vent opening, so it’s not as hard to avoid getting eaten. But later levels have two or three vents, and you have to rotate the camera and choose the right door based on which side the sound came from. If you fail to close the right door in time, it’s game over and you have to restart the level. As mentioned above, my main issue with the game is that you spend so much time staring at the dots running around the map. On top of that, the interface is very cluttered. Considering you have to make split-second decisions, it should be a lot easier to send commands to your crew mates. They’re not very smart on their own, and will often take the long way around or just waste a lot of time. But drawing long paths for them is both finicky and time-consuming. If you’re busy drawing, you’re not going to be alert enough to give them other commands if the alien shows up. Your hand is also covering part of the map while you do this. It’s also hard to juggle four dots and keep track of who’s who. When the alien appears, taking a half a second to look at the buttons so you can press the right one could mean the end of one of your crew. Some extra breathing room would have been nice, and might have made me actually want to play instead of dreading it. That eight-minute timer is what keeps you from being able to tell some crew members to hide while you focus on one at a time. It also keeps you from being able to really enjoy the visuals. Even when running, the crew moves very slowly. So if you try to play it safe and keep people hiding, you may not have time to get them all to the exit before blackout, at which point it’s game over. To make things worse, since the objectives pop up in waves, you won’t know where the next one will appear. You might have four people move to one end of the ship just to learn they now have to go to the other end of the ship and with not much time left. There’s also no way to tell how many objectives there will be. That is, unless you already played through the level before. The objective points are the same each play-through, so this is one of those situations where hindsight is 20/20. If you’ve failed or restarted a level late enough to see where all the objectives and the exit is, you can send people there from the beginning, like you can see the future. It feels cheap, like I’m cheating. But unless you get very lucky, it seems impossible to keep everyone alive and get them all to the exit in eight minutes without that foresight. I would have enjoyed the game more if I wasn’t so pressed for time and could instead work on sneaking people around carefully. Based on that and the fact that it’s really easy to mess up and die, you would think the game would make restarting a level as painless as possible. But that’s not the case. Every restart forces you to listen to the same dialogue at the beginning before you can start doing anything. Whether you’ve failed five times or fifty times, you will have to listen to it, as there’s no way to skip it. It got to the point that I started hating the voice acting just because I was forced to listen to the same words over and over. And due to the frantic nature of the game, I even started to ignore the mid-level dialogue just because I was too focused on everything else to pay attention to it. So even though the voice acting was my favorite part of the game, I didn’t even get to enjoy it. Once I gave in and started relying on that foresight that comes from replaying a level, I had an easier time and made more progress. I even managed to have a near-perfect run in the third level. Everything was going great and I got two of the four crew members to the exit. I told them to hide and then went to focus on the last two. The alien showed up at some point and I was fumbling to select the two remaining people and tell them to hide, but since all four interfaces were still on the screen, it took more time than it should have and I lost one of them. It felt like a cheap death that could have easily been solved by hiding the UI of the two that were already safely at the exit. I’m on a 10.5″ iPad Pro and the screen feels cluttered and everything you need to tap on is small, so I can’t even imagine playing this on a smaller iPhone. I was further annoyed to find out that there’s no way to restart the level and try to keep everyone alive once you clear it. The only way to do so is to restart while you’re still in middle of the level. And now I can’t get the achievements for keeping everyone alive unless I start a new game, which I have absolutely no intention of doing. Again, this seemed like a really poor oversight. Why not give the player a chance to replay the same level for a perfect run before continuing? It also meant I had to continue with three crew members instead of four, putting me at a disadvantage for the rest of the game. Speaking of which, since I wasn’t paying close attention to the dialogue anymore and I came to know all the crew members as just dots on the screen, I stopped caring about their survival other than for those achievements and for my walkthrough. They were too stupid and annoying at this point for me to care about them as people. They became dots that served a purpose and that’s all. 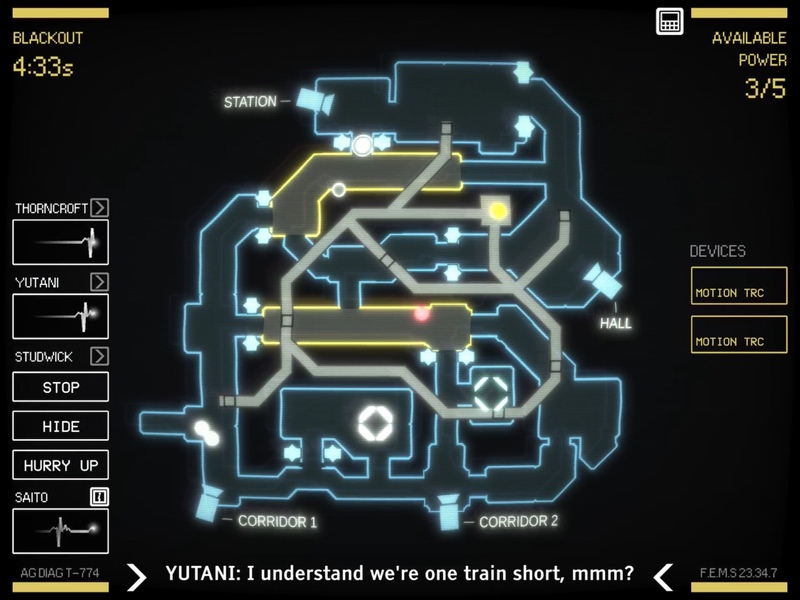 Each crew member has special skills that make them better at completing certain tasks, but good luck working that out and grabbing the correct dot to move it there when you have four of them on the screen. Most likely, you’ll just worry about who’s closest to what and forget about their skills. So when they die, you won’t really be thinking about the skills you just lost. Every time I got someone killed or failed a level, I didn’t have that “one more try” attitude, like success was just due to lack of practice. I just groaned in frustration and put the game down. And when I did manage to pass a level, it didn’t feel so much like a victory as cheating the system. I finally quit in this gameplay video below after getting killed multiple times in a vent with three doors. I have no intention of trying to pass that level, as every time I play the game I’m thinking of other games I much rather be playing because they’re actually fun. So I’m moving on, despite my high hopes for the game. It’s a shame that I ended up agreeing with PC Gamer in the end, that fiddling with a bunch of on-screen buttons wouldn’t be enjoyable. I thought this would be a game designed with touchscreens in mind, but instead it seems like someone forgot that a touchscreen isn’t a controller and that it takes time to locate an on-screen button or object before tapping it. It’s over-cluttered and expects players to manage everything on a short timer. I wish I could tell everyone to buy this game, as I laud the developers for going the route of a fully paid premium game instead of one riddled with ads and IAPs. But it’s simply not a well-designed game, despite its impressive audio and visuals. I’m still hoping the developers might realize some of their missteps and make some improvements. But as is, I think a chestburster would be a better experience. If you’re a die-hard Alien fan or just want to give the game a try anyway, you can go ahead and grab it here. But personally, I would draw you a path down a different route.